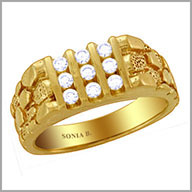 14k yellow gold men's nugget ring,0.50ct of diamonds. The rich look that he wants. Textured with a rich nugget effect, this ring shines with elegant diamond accents for a masculine power-look.Crafted in 14k yellow gold , features 12 round full cut diamonds that weight 0.50 ct, H in color and SI2 in clarity.